bebop spoken here: The Paul Donnelly Organ Trio @ Dormans Jazz Club, Middlesbrough - Feb.7. The Paul Donnelly Organ Trio @ Dormans Jazz Club, Middlesbrough - Feb.7. 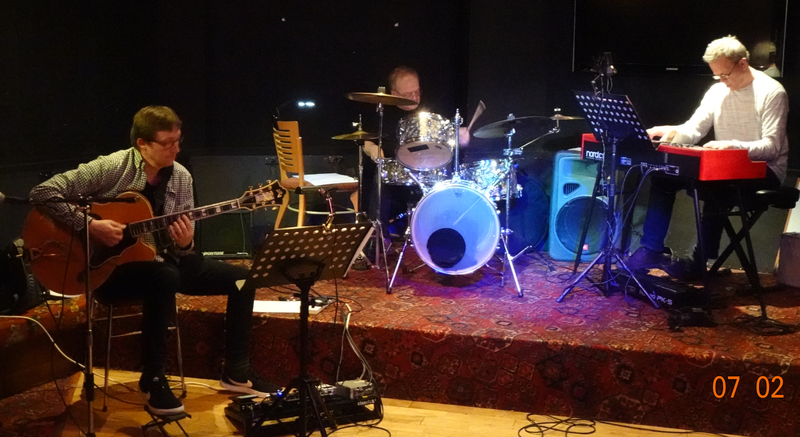 Paul Donnelly (guitar); Stuart Collingwood (organ/bass pedal); and Paul Smith (drums). The second guest band of the year at Dormans proved to be another memorable night of Jazz from three highly talented musicians. Starting with Clifford Brown's Joy Spring, and the classic Nature Boy, superb solos all round gave the audience a flavour of what was in store. Pat Metheny's James, was followed by the beautiful bossa nova Black Orpheus, with impeccable rhythm set up by Paul on drums before featuring Stuart on Jimmy Smith's The Cat, with fine keyboard work and faultless bass pedal input. Paul on guitar played a moving intro to the ballad Where is the Love? before the band finished the first half off with the up-tempo Bayou, showing their skills to play together with ease. A request for the ever popular St. Thomas, started the second half followed by a nice version of I Say A Little Prayer. An impressive ‘Round Midnight, was featured Paul on guitar with Paul Smith and Stuart joining in with perfect timing for the ending. Monk’s Straight No Chaser, showed the band’s versatility. A beautifully played Carol King's It's Too Late, and the George Benson style Affirmation, finished the second set but, such was the enthusiasm of the audience, an encore was demanded and it was Jobim's One Note Samba that brought the evening to a close. It was a pleasure to listen to these three great musicians, each doing thoughtful and exciting solos, playing so well together with such a wide variety of numbers and styles. Thanks go to the enthusiastic audience and to the help and support given to us in running the Jazz nights by Dormans Club.